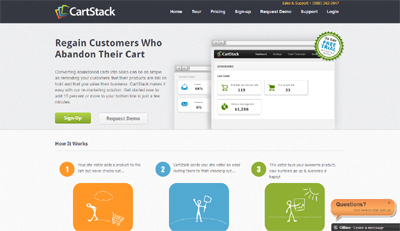 CartStack helps ecommerce companies re-capture lost sales due to shopping cart abandonment. Studies show that about 70% of all carts created are abandoned by consumers before completion of checkout. That’s huge opportunity loss. As site owners know, it’s very difficult and expensive to get someone to your website. And when you finally get there, it’s even more difficult to get them to make a purchase. So once you’ve moved the user to that point you have to do everything in your power to turn them into a paying customer. We automate this process with a simple yet effective re-marketing system. CartStack sits behind your existing e-commerce process and can be integrated in less than 30 minutes. Math. It’s proven that if you re-market to abandon cart users with optimized campaigns you can re-capture 15-25% of them. That’s a major boost to the bottom line. It just works. Also, our ability to integrate into any system/website in just a few minutes separates CartStack from many other solutions.